In the previous post we started our discussion of structures with more than one ring, using decalin as our key example of a fused ring. We saw how much the stereochemistry at the ring junction can affect the overall shape of the molecule, as well as its stability. What we didn’t talk about is that the ring junction of decalin represents only one way to arrange the ten carbons of decalin into a pair of adjacent rings: the so-called “fused” ring structure, where the two “bridgehead” carbons are directly connected. There are actually two other modes of ring junction. 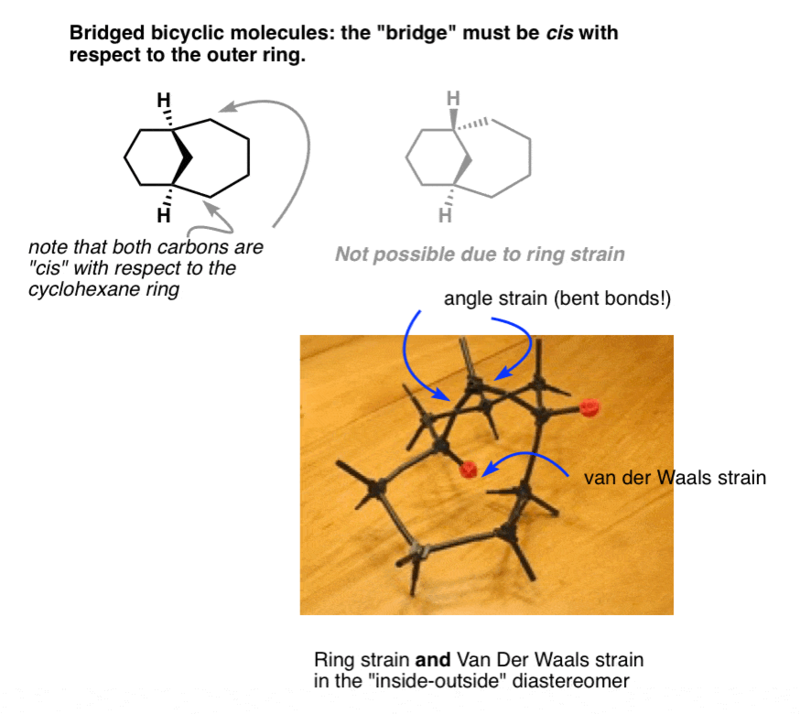 In “bridged bicyclic” molecules, the two bridgeheads are separated by “bridges” containing at least one carbon. In “spiro” fused molecules, the two rings are both joined at the same carbon. In this post we’ll focus on “bridged bicyclic” molecules (and how to name them), and also briefly touch on “spiro” fused bicyclic molecules. In Or Out? Either Both In, Or Both Out. Why? Like we said in the last post when discussing trans-decalin, for much the same reason that you can’t kiss yourself on the back – there just isn’t enough flexibility for this to happen without breaking something. Given the strict bond angle (109°) and length (1.50 Å) requirements of alkanes, five, six, and seven membered rings don’t have enough slack to tolerate anything other than cis ring junctions. A trans ring junction (much like a trans double bond in rings of these sizes) would simply lead to too much ring strain. Note that in the diagram below, the “cis” ring junctions is implied by the fact that both hydrogens are on the same side (both dashes in this case). The “impossible” trans ring junction is shown in grayscale for comparison. The picture shows a model of this molecule highlighting the angle strain and Van Der Waals strain resulting from this arrangement. Secondly – and this is where a lot of students get confused – we come to the topic of how to depict these things. Merely using dashes and wedges doesn’t truly capture their three-dimensional beauty. So when drawing bridged bicyclic molecules, it’s very common to show them in perspective from the side. The first reaction my students have upon seeing these drawings is utter disgust and confusion. “What is THAT?”, I recall Mike from Sault Ste. Marie asking me one night during a tutoring session. It’s the same thing as the “top down” view, just drawn from a different perspective. Using the “top down” view is a perfectly acceptable way to draw these molecules – however, it’s vital to be able to interpret these “perspective” drawings as many bicyclic molecules in your textbook will be shown in this way. The naming of bridged bicycles has its own special kind of funk. Unlike the molecules you’ve likely come across so far, which will have a clear “longest chain” or “largest ring” to start from, trying to find the place to start based on those criteria alone will likely have you going in circles. Instead, bridged bicycles are named according to a unique system of their own. based on the length of their bridges, and then the overall number of carbons in the bicycle. The figure below walks through the process. 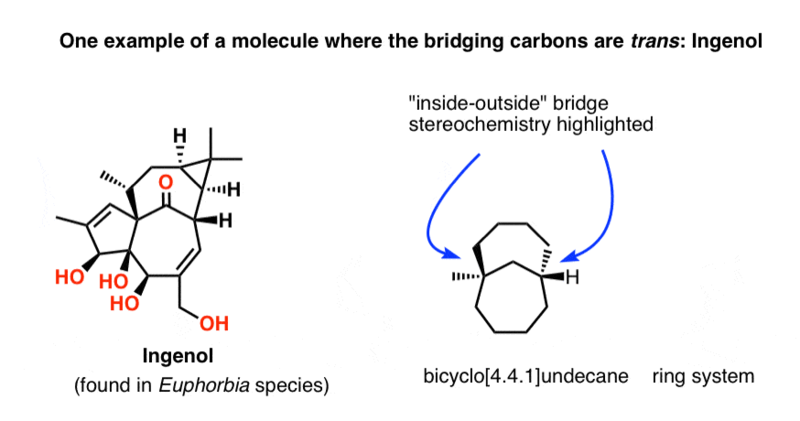 Once you’ve run through a few examples by yourself, I think you’ll find that naming bridged bicyclic molecules is actually fairly intuitive – as long as you can interpret the diagrams correctly. [Try making a model if you’re still stuck!] See if you can follow the naming of these compounds. See that last example? We can also use bridged bicycle nomenclature to name fused rings as well! So bicyclo[4.4.0]decane is simply another name for “decalin” (without specifying the stereochemistry, of course). Let’s wrap up by briefly covering “spiro” fused compounds. 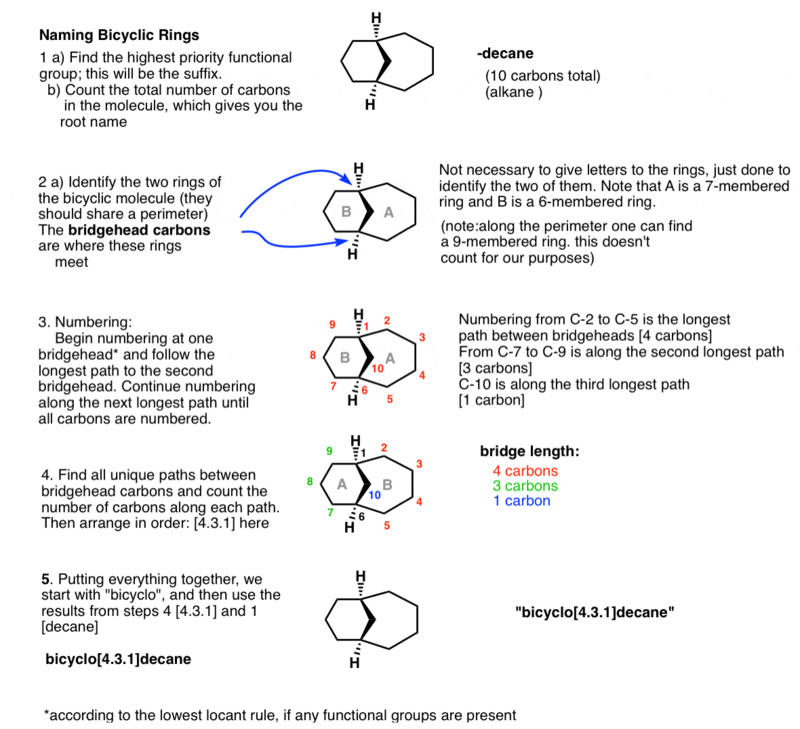 Since both “bridgehead” positions are on the same carbon, we won’t be able to use the same “bicyclo” nomenclature as before- but the process is very similar. We simply substitute “spiro” for “bicyclo” , insert the two bridge lengths, and place the suffix as before. So the molecule below is spiro[5.4]decane. Included next door are two other examples of spiro compounds, spiro[4.3]octane and spiro[5.2]octane. In the next post – and last in this series – we’ll talk about one final, very interesting consequence of the fact that carbons can form rings: Bredt’s Rule. Did you find the other bridged bicyclic isomer of decane that contains a six-membered ring? Here it is: bicyclo[4.2.2]decane. 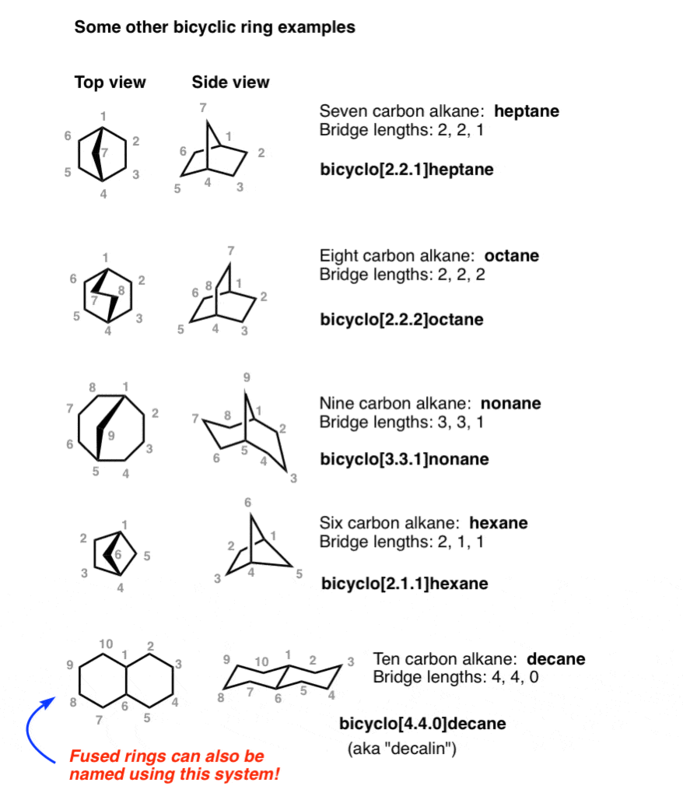 Note that the key difference is the presence of two 2-carbon bridges (in addition to the 4 carbon bridge) in contrast to the 1 and 3-carbon bridges seen in bicyclo[4.3.1]decane. Secondly, a note about bridged ring fusions. Like with Bredt’s rule (more on that next post) once the size of the ring perimeter gets large enough [11 seems to be the minimum], the rules can be bent a bit. There are known examples of molecules with trans bridgehead ring fusions, sometimes known as “inside-outside” isomerism. A very prominent example is the natural product ingenol, isolated from Euphorbia species. A close look at the [4.4.1]undecane ring structure reveals that the two carbons on one of the bridges are in fact trans to each other. This does lead to ring strain [about 5.9 kcal/mol according to one calculation], but not enough to render closure of the ring impossible. By the way, ingenol is a fascinating target for testing the limits of modern organic synthesis. Isolated in 1968, it was not synthesized until 2002 by Jeffrey Winkler’s group at Penn. Subsequently the molecule has been synthesized by the groups of Wood and most recently (and impressively) by Baran. If you’re an undergraduate interested in studying organic synthesis, Mark Peczuh has written a tour de force walkthrough of Winkler’s ingenol synthesis that explains the thinking behind the synthesis line-by-line. The Baran group also has a post on their blog, Open Flask, that gives the behind-the-scenes story of their ingenol synthesis and really conveys the flavour of what working on a total synthesis project is like. – the structure given for spiro[4.2]heptane is actually that of spiro[4.3]octane. As always, thanks for catching those spectacularly bad fails on that graphic. 2 membered ring, ha ha. Shoot. Will fix. Thanks for the spot! BTW, I have a question about naming of spiro compound. As I saw before, spiro compound maybe have low # of carbon first then next number like spiro [4,5] decane not spiro [5,4] decane. Am I right or wrong? Can you give me a answer? Many thanks for your incredible works…!!!!! Can there be more than one bridges? If yes how can we name them? I just kept things simple here. If you are truly curious you can always go to IUPAC’s website. About the other ring you mentioned, I think possibly I found it and not one but two. The names go as; bicyclo[4.3.1]heptane and the one you originally asked for; bicyclo[4.3.1]hexane. My question is, do we follow the longest carbon chain rule here to arrive at the name bicyclo[4.3.1.]decane? Thank you sir .After reading this simple topic I am able to name bicycle compound and I also try to learn the Spiro compound as well. Not sure I understand the first part of your question. Yes, 2-fluorobicyclo[2.2.2]octane is chiral and will exist as a pair of enantiomers.